Spring water, apple juice concentrate*, cane sugar*, black carrot juice concentrate*, chokeberry juice concentrate*, lemon juice concentrate*, acerola extract*, cola nut extract, great yellow gentian extract, quinine extract, natural orange extract*, ginger extract, gurana extract*, cardamom extract*, natural flavours, carbonated water. Recommended usage: 1 container per day. Due to high caffeine content, not reccomended for children, pregnant/breastfeeding women, individuals sensitive to caffeine, or mixing with alcohol. Also not recommended for diabetics or individuals sensitive to quinine. Amount of caffeine from all sources 56mg per single serving. Pasteurized and naturally cloudy. 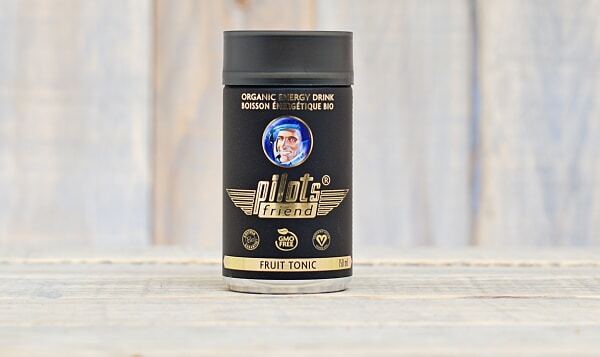 For a quick pick-me-up in the morning, afternoon or a night out, PilotsFriend provides a burst of energy without the crash felt by consuming traditionally caffeinated beverages. It also stimulates your appetite and aids natural digestion with the use of ingredients like lemon, chokeberries, ginger and cardamom. PilotsFriend is a refreshing substitute for a post-meal coffee and the perfect alcohol-free aperitif or digestif.